Betty Romshek, 82, of Bellwood, died Monday, December 11, 2017, at Bryan LGH West in Lincoln. 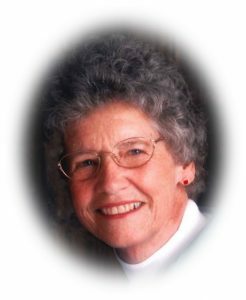 Mass of Christian Burial Saturday, December 16, 2017 10:00 A.M.
Betty Jane Romshek was born on June 20, 1935 in Ashland, NE. She lived and attended grade school in Ashland before moving to Bellwood, NE in 1948. There she attended Bellwood High School, graduating in 1953. It was also here where she met the love of her life, Ralph Romshek. The two were united in marriage on August 13, 1953 at St. Peter’s Catholic Church in Bellwood. From this union, two sons were born: Douglas M. Romshek and Daniel L. Romshek. The couple lived in Columbus for several years after marrying before settling down in the rural Bellwood area. Together they built a family, farm, and fulfilling life. Betty, who had always lived in town, began the life of a farm wife. She learned to milk cows, farrow hogs, and clean chickens, all while raising her two boys. Betty also worked as a cook at Bellwood Elementary for almost 20 years before retiring. Betty enjoyed co-ed bowling league, attending shows at Aksarben, gardening, and making her signature tomato juice. Her and Ralph were avid Nebraska fans. She regularly attended Nebraska football and baseball games, watched Nebraska volleyball as often as possible, and traveled to numerous Nebraska football bowl games. She was a member of St. Peter’s PCCW and her and Ralph belonged to the infamous Bellwood “Anniversary Club”. Betty’s greatest love of all was for her family. She always put the needs of her family before her own. She was an extraordinary wife, mother, grandmother, great-grandmother, and caretaker. Betty spent her last years caring for her husband, Ralph. Together, she and Ralph experienced everything life had to offer, both good and bad. They were united in marriage for 63 years before Ralph’s passing in January 2017. Betty is survived by sons Douglas (Crystal Henrichs) and Daniel Romshek of Bellwood, brother Ron (Peg) Sherman of Rising City, grandson Dusty (Brittani) Romshek of Columbus, great grandchildren Neleigh and Callen Romshek of Columbus, sister and brother-in-laws Christina Tillman of Ashland, Josephine Feaster of Lincoln, Jack (Betty) Romshek, Mary Pat Romshek, and Roy From all of Bellwood, and many nieces and nephews. Betty is preceded in death by her husband Ralph Romshek, mother Bess Tillman-Sherman, step-father Floyd Sherman, brother Bud Tillman, grandson Mark Romshek, sister and brother-in-law’s Pete and Elma Nicolas, Leonard and Bernice Nicolas, Jerome and Millie Beringer, Cora Lee From, and Keith Feaster.